Meet Patrick! He is a big kid who is lively, energetic, and a lot like your kids. 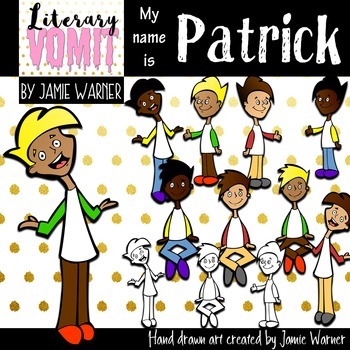 All images from Literary Vomit are for personal and small commercial use on teachers pay teachers and social media. Other commercial uses are only allowed with permission. For quantities exceeding 1000 you need an extended license, please contact me by email. When creating lesson plans for sale, the files must be flattened, uneditable and unextractable. You cannot share our original graphics for free. Due to the nature of the product no refunds can be offered. All items are handmade or digitally made by Jamie Warner.